I started using the Seinfeld calendar system in mid 2009, and evolved it into my own multi-mode (daily and weekly) calendar system within about three months. I've been using that for about a year and a quarter now, maybe a little longer, and I've gotten the hang of it. So it's time to take it up a notch. Blue, obviously, indicates unfinished areas and unanswered questions. If you check out the "needs more stuff" yellow callout box, you'll see I realized that I was budgeting much more of my time for programming than I was for acting. I already had a vague awareness of this, but it's much easier to spot on paper (or, actually, on a screen, in this case the screen of my iPad). There's actually another section on the business of acting, with a similar yellow callout box, but it's not visible here, because I've only screencapped enough of the budget to get the point across. What I'm doing here is simple: figuring out what habits I want to create, and making sure that the most important goals get the largest number of habits created to support them. If you set about to do something similar, I strongly advise you start simple. I started with one habit, uploading an mp3 daily, and only added habits gradually, over the course of at least a year and a half. Likewise, I wouldn't recommend a habit budget at all until you've already spent a good amount of time using my habit calendar system successfully. Not just because you'd be doing something overambitious and setting yourself up for failure, but also because it's silly to make a budget without first tracking spending. It's true for money and it's just as true for time. As a concrete example, look at the difference between June and July of 2010 for me. 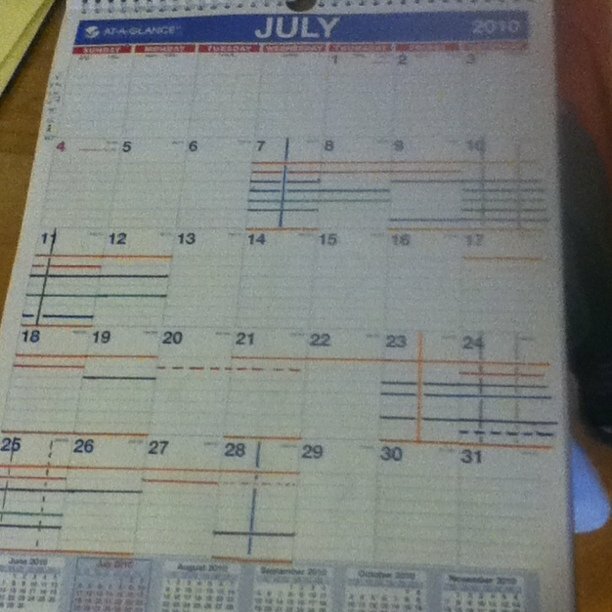 You can tell immediately that I was much better organized in June than I was in July. 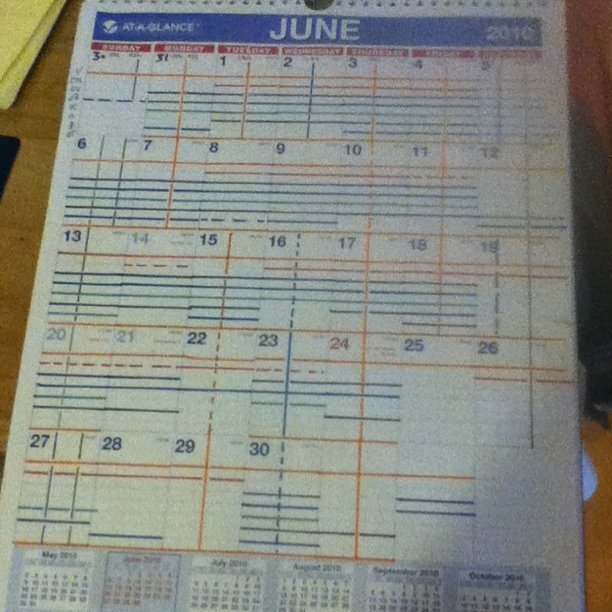 Another interesting thing is that I had remembered the month of June as the beginning of a yearlong trend of utter failure in my use of the habit calendar. In fact, as I began writing this blog post, I felt pangs of guilt and shame for even mentioning the calendar. I was very surprised to see how well I did in June, and, having just looked at all the actual pages for last year, this alleged "trend" turns out not to have existed. I did have somewhat worse consistency in the second half of 2010 than the first, but the only really remarkable failures were two specific months - July and December - and they were spaced six months apart. Not only that, the actual habits I was tracking changed after each collapse month. I don't actually see any harm in giving myself a complete month off to regroup; the whole point of this system is consistency over perfection. At this point, I'm expecting to do a new habit budget six months from now. Of course, when I do, I'll blog any interesting discoveries. Shades of orange mark category and subcategory. Blue and yellow are TODO and FIXME, respectively; headers specify what the action is, whether it's daily, weekly, or monthly, and the "when" column is an experimental feature which I think I'm going to throw away. I'll be using ChecklistWrangler to make the monthly stuff happen, and I'm using it quite happily for a morning checklist - to make sure I remember to floss every day, for example - so I could in theory schedule everything on here, but I think that level of granularity risks overburdening the system and almost guaranteeing failures. Speaking of which, I want to reiterate, wait on a habit budget until after you've already been successful with a habit calendar, both to ensure you can handle it and so that you've got some data to base it on.